I finally finished my scrap vortex quilt top today. 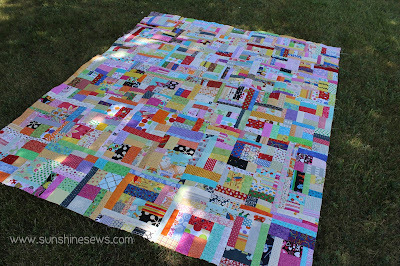 I've been absolutely obsessed with making the blocks from my scraps and the scrap vortex quilt along blog posts have been very helpful. The trouble has been finding the time to work on it. I've had a few obligations that have kept me from working on this project which is really not a bad problem to have. I don't like to use the word 'obligations'; the word feels like it has such negative connotations. My 'obligations' include working in a quilt shop as a web page designer and social media developer, making charity quilts for veterans with my church group and my family obligations include babysitting my granddaughters and taking my mom to her doctor appointments which is usually followed by lunch with mom. They hardly sound like obligations at all. I may have started the scrap vortex quilt during the final week of the quilt along however, I think I got this part of it completed rather quickly, all things considered. If you would like to follow Amanda Jean's instructions to make one of your own, just click here for the quilt-along. It looks absolutely amazing!!! Thanks for quilting along with me!